International Journal of Modern Biological Research (IJMBR) is an open access academic refereed journal published monthly by BluePen Journals. IJMBR publishes research articles that report premier fundamental discoveries and inventions, and the applications of those discoveries, unconfined by traditional discipline barriers. All articles published by IJMBR are published in English. 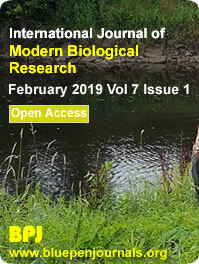 The objective of IJMBR is to publish the most significant as well as innovative articles in the area of biological sciences as well as biomedical sciences; in other to accelerate the sharing and free-access of knowledge. Biochemistry, Biomedical Sciences, Biophysics, Cell Physiology, Cellular Biology, Conservation, Cytology, Developmental Biology, Ecology, Embryology, Endocrinology, Entomology, Genetic Markers, Genetics, Helminthology, Histology, Hydrobiology, Ichtiology, Molecular and Cellular Biology, Molecular Biology, Paleoecology, Parasitism, Plant Pathology, Plant Science and Botany, Pollution Study, Soil and Environmental Sciences, Toxicology, Zoology, etc. All articles that are submitted to this journal are made to undergo sectioning to ensure that they are in line with the scope of IJMBR and as well as the instructions for authors. Thereafter they are double-blindedly peer-reviewed by both internal and external reviewers. More than 100 reviewers are working diligently to shorten the review cycle of the academic research publication; and help researchers to pay more attention on the research itself, not waiting for too long, for suggestions from reviewers. To be accepted, a paper must be judged to be truly outstanding in its field and to be of interest to a wide audience. The primary criteria during the review and selection process of the submitted papers are; sound theoretical basis, valid empirical application and analysis, and contribution to the fields of medicine. The primary criteria in the final selection of the papers once the review process is complete are quality, originality, and relevance to the international medical fields. The electronic version of published article is available at www.bluepenjournals.org/ijmbr. The articles on this website are available in abstracts and full-text; and are accessible, free of charge to our web visitors. Copyright is a major issue for IJMBR. Manuscript submission and their accessibility is not an infringement of copyright. All articles in IJMBR remain the property of their authors. The contents of published articles represent solely the ideas of authors. Editors as well as Board of Editors of IJMBR are not responsible for the views expressed by authors. However, the Editorial Board of IJMBR takes responsibility for making publication decisions for submitted manuscripts based on the reviewer�s evaluation of the manuscript, policies of the journal Editorial Board and legal restrain acting against plagiarism, libel and copyright infringement. Abbreviation: Int. J. Mod. Biol. Res.